This from The Hopewell News, Monday, September 25, 1995, "Mr. Joseph M. Heretick, 78, of Hopewell, died Saturday. Sept. 23, 1995, at John Randolph Hospital. Mr. Heretick was born in Prince George County. Va., the son of the late Julius J. Sr. and Sophie Boucek Heretick. Mr. Heretick was a veteran of the Army National Guard; veteran of the U.S. Navy in World War II; founder of the Heretick Feed and Seed Co., Hopewell and Petersburg; member and Past Grand Knight, Fr. John J. Massey Council, Knights of Columbus; member and Past Faithful Navigator of the Appomattox Assembly of the 4th Degree Knights of Columbus; and member of the Veterans of Foreign Wars, Hopewell. Mr. Heretick is survived by his wife. Irene Jones Heretick; sons, Martin T. Heretick of Hopewell and Timothy J. Heretick of Prince George; five grandchildren: brothers, Julius J. Heretick Jr. of Leigh High Acres, Fla., Rudolph S. Heretick of Prince George and Alex Heretick of Hopewell; sisters, Mary Jo Geiger of Folsom, Calif., Elizabeth Crocker of Carmichael, Calif., and Margie Palmer of Prince George. The business was founded in the mid-1940s by Joseph Martin Heretick (1916-1995). In the 1940 U. S. Census Joseph M. Heretick was 23 years old, lived in Prince George County, Virginia, and was employed as a "nitrate operator, chemical manufacturing company." He served in the U. S. Navy in World War II, and in 1944 married Irene Mae Jones in Hopewell, Va., when he gave his occupation as sailor. In the early days of the business Heretick had a partner, Leonard Raymond Kloske (1922-1991). Kloske was born in Chicago, Ill., and possibly met Heretick in the Navy, as he too served in the U. S. Navy in World War II. There was a family relationship, also. His sister, Dorothy Julia Kloske, married Heretick's brother, Rudolph Stephen Heretick (1915-1996). Petersburg city directories listed Leonard R. Kloske as a partner at Heretick Feed & Seed from 1948 through 1955. 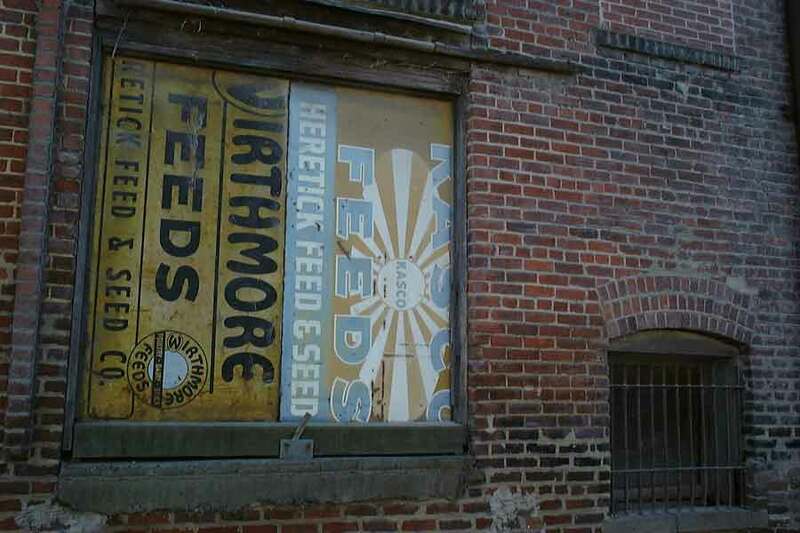 Heretick Feed & Seed here on Bollingbrook St. at the corner of Third St. was preceded by Petersburg Feed & Seed Co., as witnessed by this ad for Heretick Feed Co. from 1953. Petersburg Feed Co. (later Petersburg Feed and Seed) was founded at 201 Bollingbrook St. ca. 1933 by James H. Thweatt. James Henderson Thweatt (1884-1963) came from a family of grocers, that included F. F. Thweatt & Bro. which can be traced back to 1897, when Frank F. Thweatt was a grocer at 10 South Sycamore St., and continued until 1929. F. F. Thweatt was Francis Fitzgerald Thweatt (1872-1943), and his brother was Archibald Thweatt (1876-1956). After 1929 Francis F. Thweatt went into real estate and insurance, while Archie Thweatt continued as a wholesale grocer. He shared space at 201-203 Bollingbrook St. with his brother James H. Thweatt through 1937. Archie Thweatt ended his career as a salesman at H. P. Harrison & Co., wholesale grocers, Petersburg. The following notice appeared in the Petersburg Progress-Index 5 Sep. 1956, pg. 11, "Archie Thweatt, 80, of 323 Webster St. died today at 2 a. m. at his home after an illness of several months. Mr. Thweatt was a son of the late Francis Fitzgerald and Bettie Baird Thweatt, and a native of Dinwiddie County, but had made his home in Petersburg for the past 50 years. He was employed as salesman for the H. P. Harrison Co. Surviving are his wife, Mrs. Fannie Moore Thweatt, of Petersburg, four daughters: Mrs. James F. Shivar, of Alexandria; Mrs. Henry K. Towler, of Petersburg; Mrs. Waverly W. Townes III, of Louisville, Ky.; and Mrs. Robert M. Lyon, of Buffalo, N. Y.; a son, Archie M. Thweatt, of Hopewell; a sister, Mrs. Willis Thweatt, of McKenney; two brothers: W. F. Thweatt, of Richmond; and James H. Thweatt, of Petersburg; seven grandchildren and several nieces and nephews." The following obituary appeared in the Petersburg Progress-Index Wednesday 30 Jan. 1963, pg. 16, "James Henderson Thweatt, 78, a retired executive, died at 10:30 last night at his home, 1719 Berkeley Ave., after a period of declining health. A son of the late Francis Fitzgerald and Betty Baird Thweatt, he was born in Dinwiddie County and had lived in this vicinity all his life. He was active in the religious and fraternal life of the city; a member of Tabb Street Presbyterian Church, serving as an Elder of the church, and a member of Blandford Lodge No. 3, AF&AM. He is survived by his wife, Mrs. Ellen Barrow Thweatt; a sister, Mrs. Willis G. Thweatt of McKenney and a number of nieces and nephews. Funeral services will be conducted Thursday at 12:30 p. m. at the grave in Blandford Cemetery with Dr. F. Hubert Morris, pastor of Tabb Street Presbyterian Church, officiating." Before Petersburg Feed & Seed, James H. Thweatt was a salesman at Camp Fertilizer Co., located at 401 River St., Petersburg. Camp Fertilizer was founded by William Henry Camp (1848-1915) ca. 1907 on River St. near 5th St. William H. Camp was a long time tax collector in Petersburg, and his fertilizer business was continued after his death by his wife, Mary Louise Ashby Camp (1859-1930), his daughter, Mary Jeffrey Camp Acree (1882-1950), and a son-in-law, Luther Smith Acree (1882-1941). Camp Fertilizer was located on River St. through the mid-1930s, then moved to 804 Bollingbrook St., where it was renamed Acree Fertilizer Co. L. Smith Acree died in 1941, and the business closed at that time. Before Mary Jeffrey Camp, L. Smith Acree was married to her sister, Ashby Pendelton Camp (1885-1924). On his death in 1915 William H. Camp's obituary, Richmond Times-Dispatch, 17 May 1915, pg. 4, read in part, "William H. Camp, prominent citizen, bank director and Confederate veteran, of Petersburg, died at Grace Hospital last night at 8:30 o'clock, following an operation for stomach trouble. Mr. Camp had been a patient in the hospital for nearly two weeks. Widely connected and widely interested in all the affairs of the city, Mr. Camp had been for years one of the most prominent men in Petersburg. For nearly a quarter of a century he was city collector, being repeatedly elected against slight opposition. For many years he was interested in a drug business, for the past fifteen or twenty years he had been engaged in the fertilizing business. He was a man of financial resource, it is said, and his holdings in business and real estate were large. Up to the time of the beginning of his illness he was actively engaged in his affairs, and was still looked upon as a leader. He served throughout the War Between the States, and was an active member of Petersburg Confederate organizations. He had expected and planned to attend the Confederate reunion here in June. Mr. Camp was the son of John W. Camp, who was also a prominent citizen of Petersburg. He is survived by his wife, one son, Charles Camp, a student at Washington and Lee University, and by three daughters - Mrs. Smith Acree, Miss Mary Jeffrey Camp and Miss Harriet Camp, all of Petersburg. " Heretick Feed & Seed had locations both here at 201 Bollingbrook St., Petersburg, and nearby in Hopewell, Virginia, at 415 S. 15th Ave. I found ads for the business in Petersburg through the mid-1970s, but much later for the Hopewell location (1990s).